Mulberry Metal 3-Gang Standard size combination wallplate in white color, has stainless steel construction and smooth semi-gloss finish. 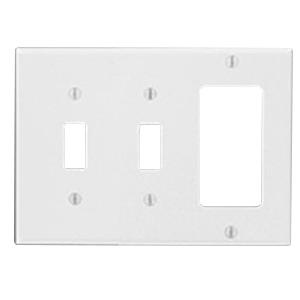 Rectangular GFI-surge combination wallplate has horizontal orientation and employs two toggle switch as well as one block duplex/GFI receptacle configuration. Combination wallplate is great for general-purpose applications. Wallplate is UL listed.